"Living in a consolidated residential area in Las Rozas and excellent communications with Madrid, with the necessary services in day to day but in a quiet and very careful environment" This townhouse is located in urbanization with common garden areas, multi-sport area and swimming pool with surveillance and permanent maintenance. Solid construction, air conditioning and facade of brick gresificado with great air chamber and insulation in walls. Exterior carpentry in white lacquered aluminum with double glazed windows and excellent thermal insulation as well as perfect sealing. The materials used in interiors are enameled stoneware and national cream marble in bathrooms and kitchen, floors in the three floors of the house of varnished natural oak wooden parquet, also used in the interior carpentry of cupboards and doors. This townhouse is distributed over three floors; - Attic for multiple uses with separate storage room and two large windows. - Second Floor with four bedrooms; one of them being the main one with full bathroom en suite, a full toilet to service the other three bedrooms and hallway distributor. - First floor with one bedroom, full service toilet, kitchen furnished with boiler estanca (natural gas heating), living room with access to the porch and garden with barbecue area and corridor hall with main entrance and sunroom and garden. - A cream marble staircase and wooden structure, allows access to the Plant Basement in which the Garage with capacity for two vehicles is located. 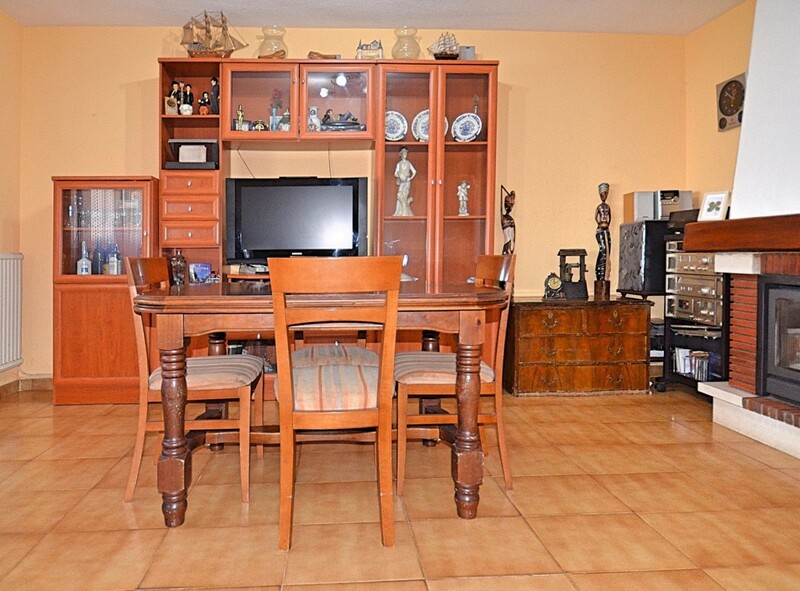 SPACIOUS SEMI-DETACHED HOUSE IN THE URBANIZATION SANTA TERESA IN COLMENAR VIEJO. 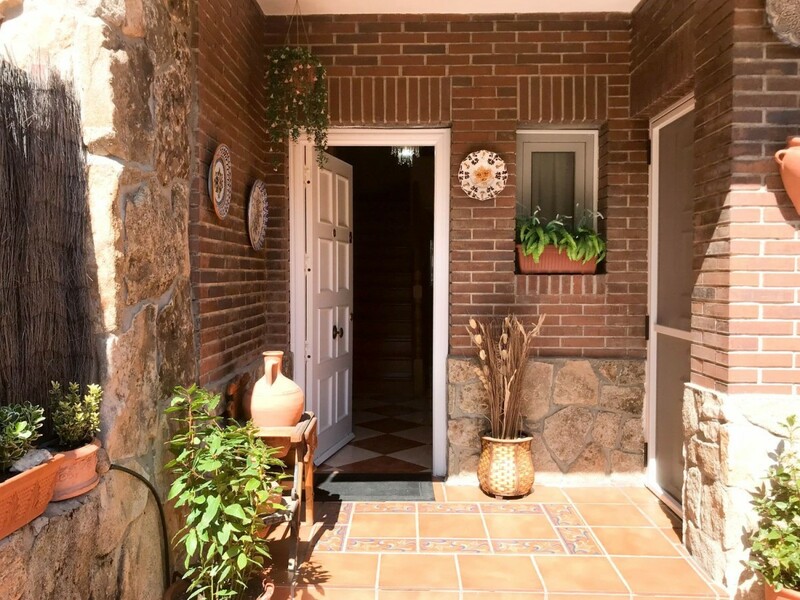 Very quiet area close to the Sierra, very well connected to Madrid and the surrounding villages, equipped with all the necessary services for a comfortable life, quiet and in contact with nature. On the main floor of the house, there is a large living room with marble fireplace, large windows that give natural light and access to the back porch of the house, the garden and the private pool. We have, also on this floor, a large kitchen with white cabinets and appliances that make it very bright, in addition to its bow window, a toilet and several wardrobes with plenty of space. Going down, in the mezzanine, we have a large room dedicated to winery and summer dining room that also communicates with the pool and a space dedicated to pantry and / or storage. On the ground floor, the garage for two vehicles, the room of the boiler and the laundry room with enough space for washing machine, dryer, etc … Going up from the main floor, on the mezzanine floor, we find a huge office-study with high ceilings and large windows that also has a file room or closet. The main terrace of the house with a covered part is also in this mezzanine. On the upper floor, we have four bedrooms, the large master bedroom with en suite bathroom and dressing room, two more bedrooms and a bathroom that serves them, plus a fourth bedroom with bathroom also en suite. Two of these bedrooms have access to a covered terrace type gallery that has many applications for its light and breadth. The house could have up to six bedrooms transforming the utility of any of the rooms of the other floors. Townhouse in Los Robles. Distributed over four floors, it has five bedrooms and four bathrooms, cellar, three sun terraces, front and rear gardens and two parking spaces. Plant street: front garden, distributor, toilet, kitchen and living room with access to the back garden. First floor: distributor, master bedroom suite (large exterior bathroom and terrace), two bedrooms (with 1.35 cm beds) and large bathroom with exterior window. Upper floor-attic: two bedrooms (each with terrace-solarium) and bathroom. Basement: cellar, garage for two vehicles and boiler room. Urbanization of 20 neighbors with private access, community pool and extensive meadow. Very quiet area, with beautiful views, near the center of Torrelodones. Splendid townhouse with pool in the best area of Punta Galea Located in the center of Punta Galea, with bus stop just 100 m. , has in the vicinity of all services and a small shopping center. 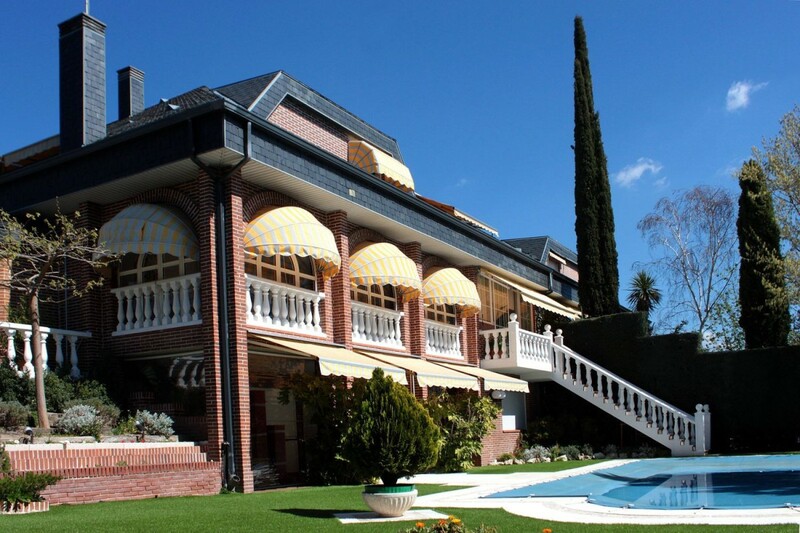 On the ground floor has a living room of more than 70 m2, a large terrace, which in winter can be closed completely. Large kitchen with large pantry and toilet. Garage space on the same floor with direct access to the house. On the top floor, we find four bedrooms and two bathrooms. The main one has the bathroom en suite, completely renovated with shower, and the rest share the restroom bathroom. The attic is very bright, with four velux, large capacity cabinets It is perfect for both bedroom and living room. The house is completely renovated with high quality materials In the common areas it has a swimming pool, paddle court and garden area. ". 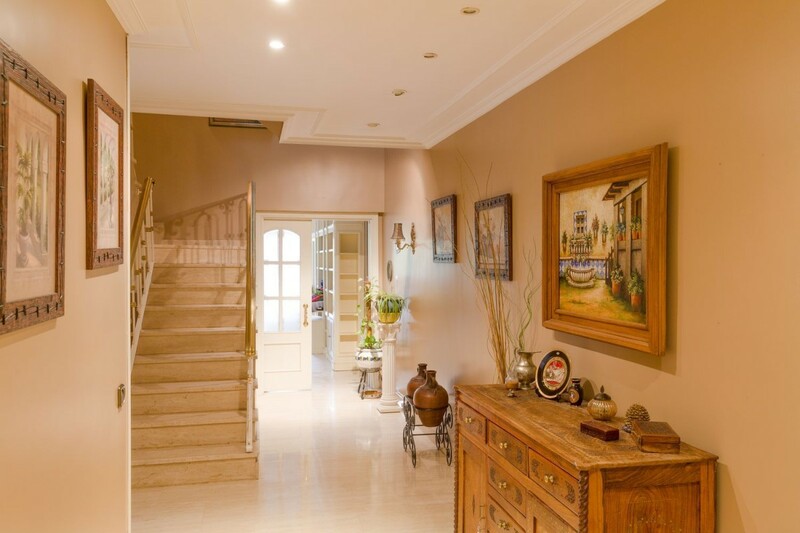 This semi-detached house located in Las Rozas, has 500m built on a plot of 584m, has a private pool and a beautiful garden with grove of trees on three floors plus one in the basement. Its qualities are high, newly renovated is ready to move into. Its 6 bedrooms all have their own bathroom, plus a full bathroom on the ground floor. The spacious and bright kitchen with access to the garden gives way to a large dining room and a large living room with large windows overlooking the garden. 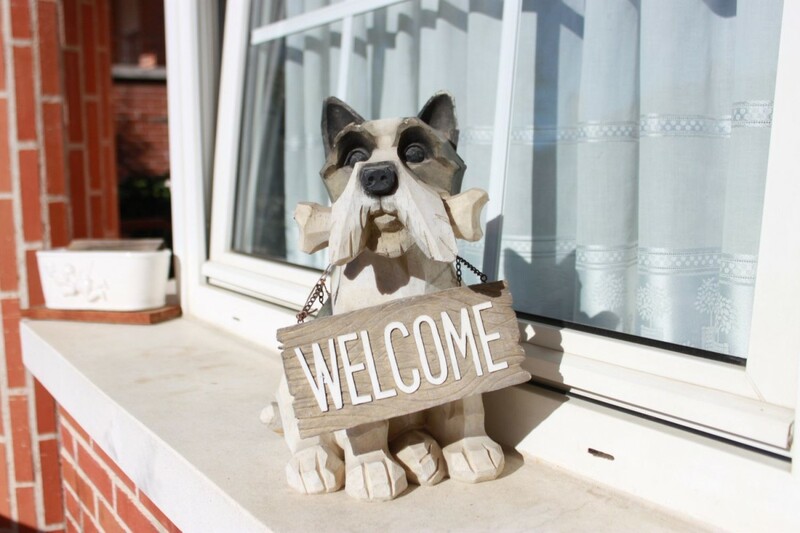 Its location is privileged because it is located in a very quiet area, but next to schools and the center of the town with all the necessary services for daily life. It also has a quick communications from the A6, buses and near the station of Renfe de Las Rozas. If you want maximum tranquility but at the same time have all the services next door, this chalet is an excellent choice. 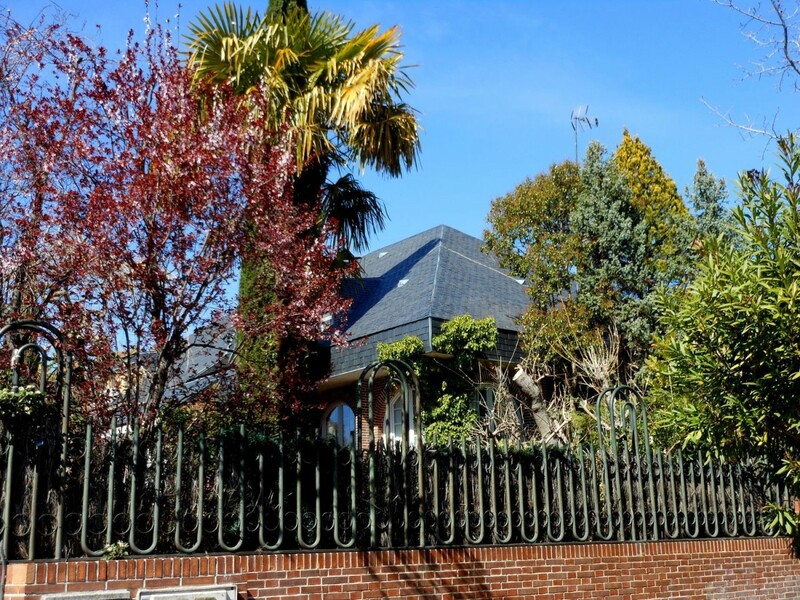 Great semi-detached house in the most prestigious urbanization of Monte Rozas with great luminosity. The house is distributed on 3 floors. On the ACCESO floor, there is a spacious living room of about 65 square meters with access to a spacious porch, a marble bathroom and a wonderful kitchen with a dining area. On the first floor there are 4 bedrooms, one en suite with dressing room and recently updated bathroom and a nice glazed terrace. On the ground floor there is another large living room of more than 40 square meters, a guest bedroom with bathroom and a large storage area. The fully consolidated garden has a 50 square meter pool and a large area of meadow. No photos of the house are shown by express wish of the owners. Detached Housing TO ENTER To LIVE of 534 m2 and a plot of 1,216 m2 in the best urbanization of Monterrozas. The House is distributed on three floors. The ENTRANCE PLANT has a built area of 217.93 and distributed in entrance hall with wardrobe Gabanero, living room of about 60 m2 with fireplace and access to a closed porch of about 25 m2 overlooking the pool area, courtesy toilet, kitchen with office and a garage for two cars. The Kitchen, extraordinarily luminous, is completely refurbished with white wooden cabinets, a daily dining area and a washing area, with direct access to the garden area. At The entrance of the house there is a large porch of more than 8 m long by 2.5 wide with views to the large front garden. On The FIRST FLOOR we have the main bedroom of more than 30 m2 without counting the dressing room and with a marble bathroom with two sinks and a hydromassage bath. In Addition, in this plant we find three double bedrooms, all with surfaces of more than 12 m2, a divided bathroom in two zones, and two large terraces, one of them semi-enclosed. Finally, the BASEMENT has another bedroom of more than 16 m2, complete bathroom, boiler room, warehouse of more than 20 m2, another space that can be used as bedroom, office or work area of more than 30 m2 and another room of about 50 m2 Also With chimney and with access to a covered porch of 8.5 m by 2.80 m, located at the height of the swimming-pool. All the carpentry of the house is lacquered in white, the walls are smooth and the windows with Climalit The swimming pool, surrounded by artificial turf of The top quality, has a size of about 77 m2. In The garden There is also an area with construction barbecue and a warehouse for tools and materials. 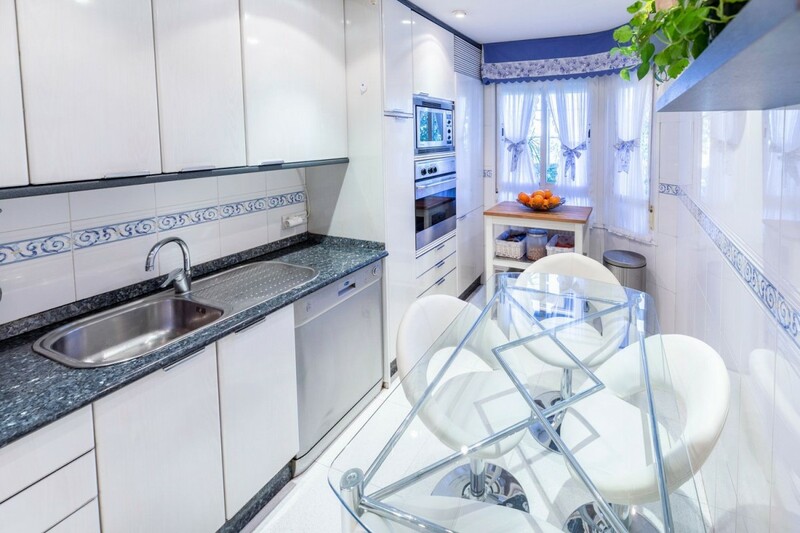 The House has around it all the services, schools, shopping centers, leisure centers, several buses and comfortable access to the road of El Escorial and to the M-50. 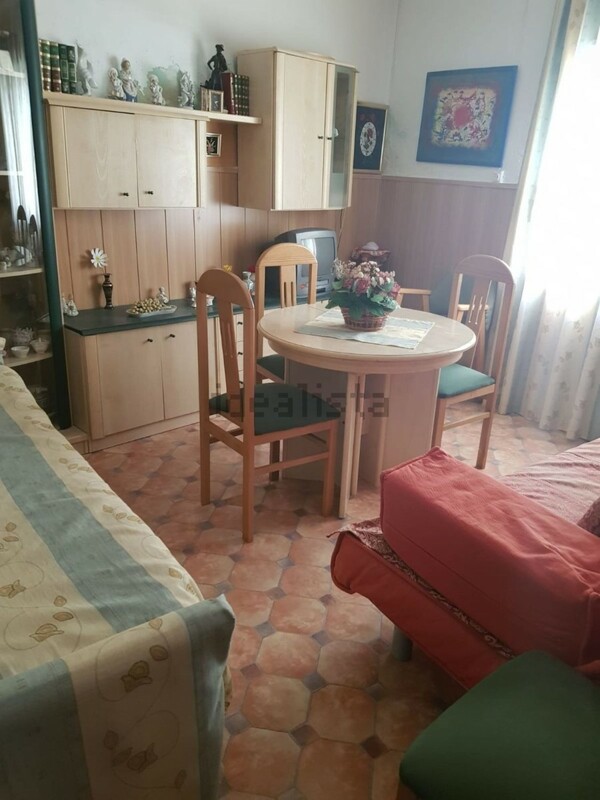 House with two floors in good condition, in Colmenar de Oreja, Madrid. Three bedrooms, bathroom and a toilet.